Any newcomer to mochaware would be forgiven for thinking that the decorated pottery was the latest from some hip, new gallery. In truth, mochaware or (mocha ware) is some of the most varied and fascinating decorative pottery of the late eighteenth and early nineteenth centuries. However, its vivid colors, modern splotches, striking patterns and wild, free-flowing designs absolutely evoke today’s contemporary art pottery. The thing is, mochaware was never intended as art. It was first made in England in the late 1700s as utilitarian pottery, used primarily in taverns and modest homes. By the early 19th century, it was imported into America and later produced here. No one potter seems to be credited with introducing mochaware; it was made by numerous manufacturers from the late 18th century well into the 20th century. The telltale sign of mochware is its “wet-surface” look decorated with crawling worms (‘earthworm’), swirling cats’ eyes, sea life (‘seaweed’), rolling waves, alternating bands of color, trees and cross-hatches, and purely random squiggles. 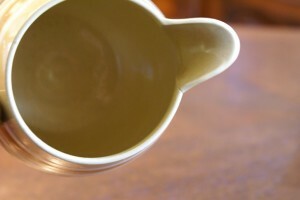 Many people assume that mochaware is named for the palette of colors it uses: browns, creams, grays, blacks, and muted tones of blue, green, pumpkin, and yellow. It refers instead to the Red Sea port of Mocha (now in modern day Yemen), a city associated in England with the export of dendritic, or moss agates (Mocha stone). The stone features natural striations similar to the wares’ seaweed and tree-like decorations. 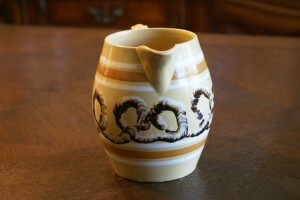 Mochware pieces were factory-made and lathe-turned. That signature “wet surface“ look was achieved by coating pieces in a runny mixture of clay and water known as “slip,” then applying a tea made of tobacco juice, turpentine, hops, and even urine. 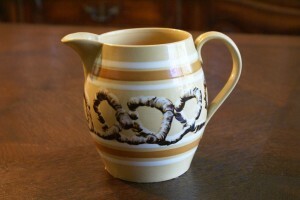 The resulting chemical reaction formed dendritic patterns in the glaze. Other designs were painted, scratched or stamped on with fingers, brushes, or other objects, resulting in a multitude of layers and colors. The colorful decorations make each piece unique and add to mochaware’s desirability and collectability. One scholar tracked over 4000 unique pieces and another has identified 22 distinct designs that make mochaware unique from other pottery. Most mochaware has a clear lead glaze, but colored glazes were added to specific areas to produce the desired color. Mochaware was very popular in Colonial New England, and has become a favorite with folk art collectors. There is now a whole industry of mochaware reproduction based in upstate New York. 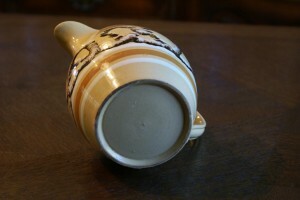 Because it was used on a daily basis, few examples of original mochaware have survived over the years, making it a rare American collectible. The simplest, smallest forms fetch hundreds of dollars; large multi-colored wares go for as much as five figures. 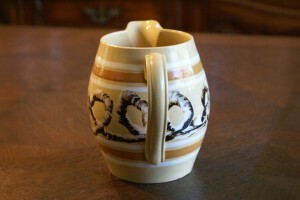 Mugs are most common, followed by bowls, jugs, pots, and vases. Flat items such as plates and saucers are extremely rare. The best a collector can hope for are pieces in good or fair shape, as mint-condition mochaware pieces are rare. Be on the lookout for this hidden pottery gem.